ASHEVILLE- The South Atlantic League announced its weekly awards earlier today, this one spanning a week-and-a-half, from Opening Day, April 4 through Sunday, April 14. 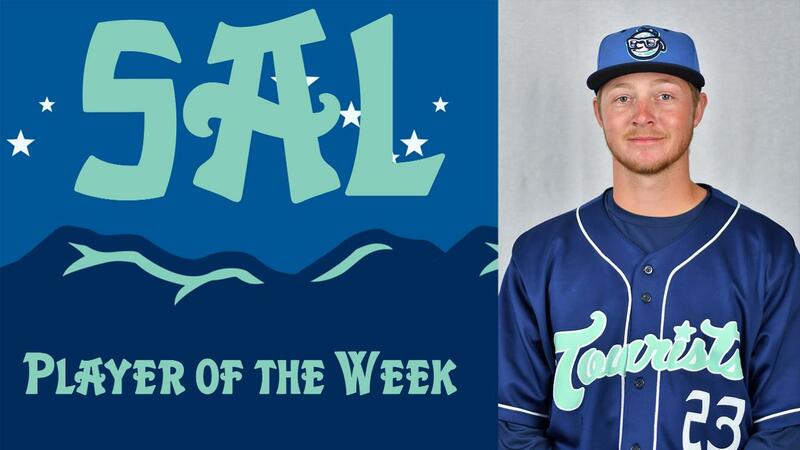 The recipient of the South Atlantic League Player of the Week during that time span is Asheville Tourists catcher Willie MacIver . The Pleasant Hill, California native appeared in ten of the Tourists 11 games over that stretch and hit safely in eight of them while reaching base safely in nine. MacIver went 13-for-34, a .382 average, with three Home Runs, four doubles, one triple, six runs scored, and 11 runs batted in. MacIver currently sports a .405 on-base percentage and a 1.229 slugging percentage. The former Washington Huskie recorded five multi-hit games and currently sits third in the league in batting average, third in RBI, second in Home Runs, and first in extra-base hits. MacIver is the first Tourists player in 2019 to be named the SAL Player of the Week. The Asheville Tourists open up a three-game series in Hickory later tonight. The Tourists return to Asheville on Thursday, April 18 for a Thirsty Thursday contest against the West Virginia Power. Tickets are available by contacting the McCormick Field ServPro Box Office.